Purchased from the Ramapoo Indians in 1708, Ridgefield welcomed immigrants to its bustling community from the start. The peaceful Connecticut town later served as a retreat for wealthy New Yorkers. With its long history and cast of local characters, Ridgefield has many fascinating stories to tell. In the early 1900s, Typhoid Mary was known to cook for a Ridgefield family. On Olmstead Lane, the landmark that most locals think is a broken fountain is actually a watering trough. 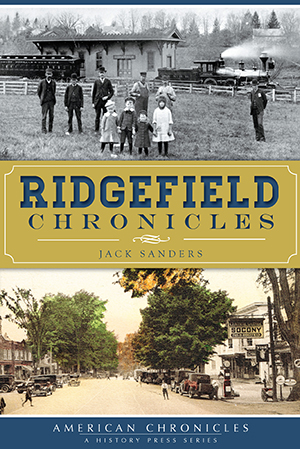 For more than forty years, newspaper editor Jack Sanders has covered the captivating history of Ridgefield. In a uniquely selected collection of articles, the town's history comes to life with tales of Pulitzer Prize winners like Eugene O'Neill and disasters such as the 1905 train wreck. These and other glimpses of the past celebrate Ridgefield's rich history. A Connecticut native and graduate of Holy Cross, Jack Sanders retired in 2014 after 45 years as an editor of the Ridgefield Press, a 140-year-old community newspaper. He's written a half dozen books of history and natural history, including "Ridgefield 1900, 1950" (Arcadia), "The Secrets of Wildflowers" (Lyons), and "Hedgemaids and Fairy Candles" (McGraw-Hill). He and his wife, Sally, also a newspaper editor, live in a 250-year old farmhouse in Ridgefield.